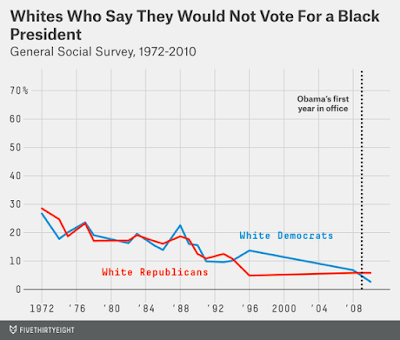 Blaming The Donald on Sen. Barry Goldwater is essentially the claim of this Vox piece. 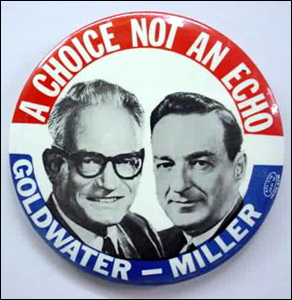 Barry Goldwater (1909-1998) was the libertarian-inclined Republican Senator who won the Republican presidential nomination in 1964 and was then defeated in a 61% to 39% electoral landslide by LBJ. The strong on national security, rhetorically keen on small government strain of politics that Goldwater represented may have lost the 1964 US Presidential election, but it went on to become increasingly powerful within the Republican Party, leading to Ronald Reagan's nomination and successful two-term Presidency (three-term, in effect, with Bush Snr's 1988 win). Sen. Goldwater famously articulated a federalist opposition to the (federal) Civil Rights Act of 1964, swapping (declining) African-American support for Republicans for the votes of (much more numerous) Southern whites. At least in the long term--it did not do much for Goldwater himself and it was not until 1994 (i.e. 30 years later) that the South finally forgave the Republican Party for the Civil War. And that on the basis of the Contract with America, which was conspicuously non-racial in its content. Goldwater's opting for "states rights" over civil rights, a seminal moment in the Republican Party's Southern strategy, has long been treated by progressivists as the Original Sin of the modern Republican Party. Reagan's success (as with Margaret Thatcher's in the UK) was part of a general tendency to market liberalisation that outraged many progressives, who took it as a vile de-railing of the "proper direction" of History and for whom the only proper path for the Republicans was to be a pale and compliant version of the Democrats. Whenever the "culture wars" heat up, this Origin Sin is trotted out to explain why the Republicans are wrong/evil/stupid/ignorant. With the nomination of The Donald being an excellent vehicle for revisiting this hardy perennial. LBJ himself commented that the Civil Rights Act would mean losing the South for a generation. Actually, it took a generation for the Democrats to lose the South, at least at a Congressional level. (The Republicans did better in the South in Presidential elections from 1964 onwards.) But his underlying instinct was surely correct: by embracing civil rights so emphatically, and setting itself up as essentially the monopoly-political-provider for African-Americans, the Democrats were driving away lots of Southern whites: in a two-Party system, that meant to the Republicans. It is obviously true that lots Southern whites went off and voted Republican, first in Presidential elections and eventually in Congressional ones (though the evidence on white racism in general is a lot more equivocal). 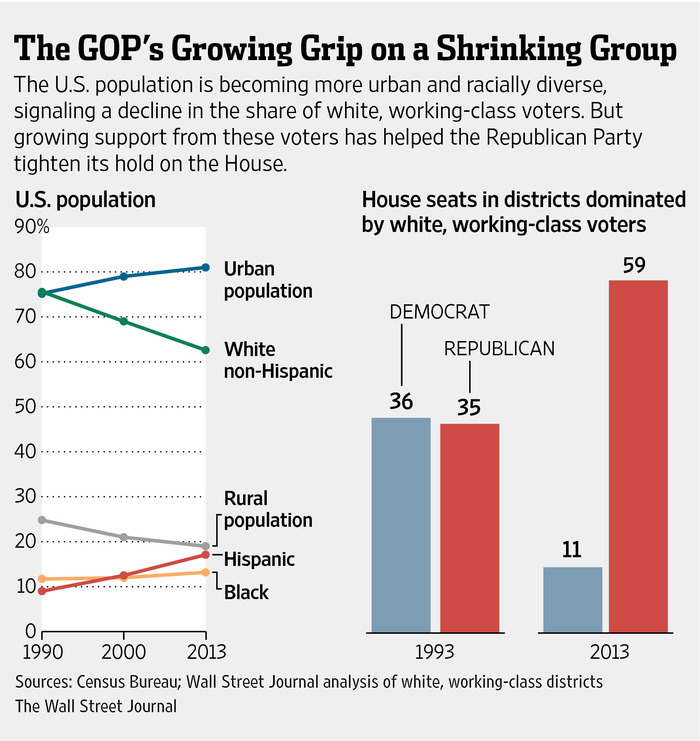 The Republican Party was where white racism (to the extent that it did) went off to be politically frustrated. White racism got far, far less from the Republican Party post-1964 than it did from the Democratic Party pre-1960. For two reasons: first, the identity as the Party of Lincoln still had rhetorical power among Republicans (as Sen. Trent Lott discovered) and, secondly, the US was becoming a far less racist society than it had been. The penalties among the wider electorate, and within the business and professional classes who provide money and staff, of open racism was much greater than the benefits, and have been getting more so all the time. Then along comes The Donald, clearly appealing to white tribalism. His appeal started off not among people the Republican Party had successfully actively engaged, but folk that it had not. Which fitted with him not actually being a Republican in any serious sense. 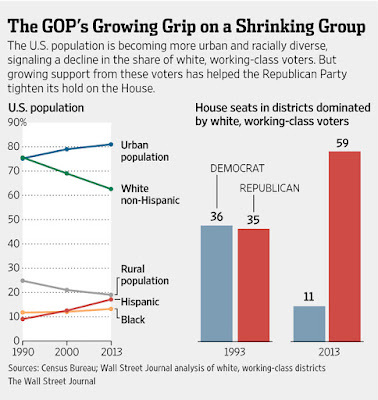 This 52 years after the 1964 Civil Rights Act, 36 years after the "Reagan Democrats" marking a long drift of white working class voters from the Democrats to the Republicans. Clearly, something else has been going on. (What that is, is the subject of my next [a later] post). But, whatever it is, it is not Barry Goldwater's fault. 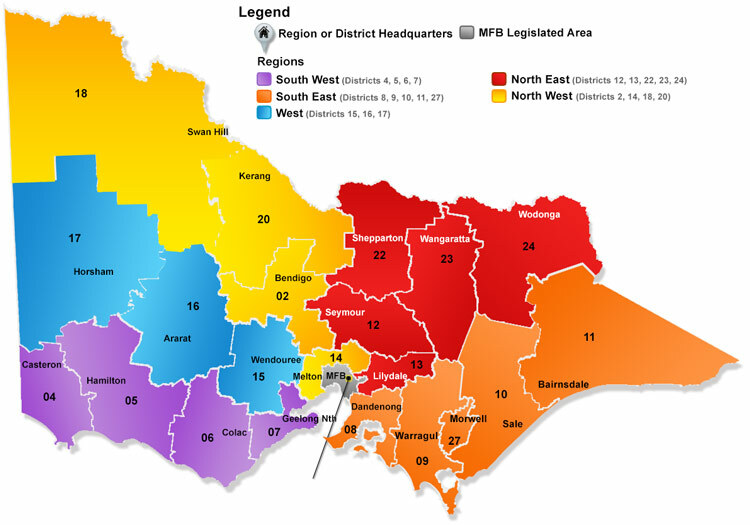 The Country Fire Authority (CFA) of Victoria has 60,000 volunteer firefighters to fight fires, particularly bushfires, outside the area covered by the Metropolitan Fire Brigade (MFB). 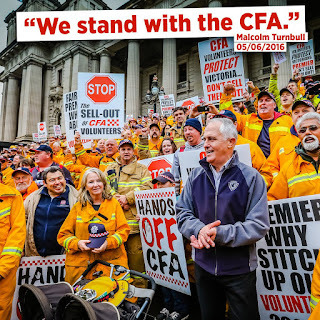 CFA volunteers are deeply linked in with their local communities and represent a huge saving to the Victorian taxpayer. The CFA represents a fine example of practical social capital. As Victoria's urban population increases, the interactions between the CFA and the MFB increase and the number of politicians, staffers, bureaucrats and union leaders who have little or no connection or interaction with rural Victoria also increases. The MFB staff are covered by the UFU (United Firefighers Union). As part of bargaining for an enterprise agreement, the UFU has been pushing for more operational control by the MFB over the CFA. Let's pause here: why is this a matter for an enterprise agreement? Why is it a union demand at all? Because it elevates the standing and prospects of (urban) firefighters over (as it happens) rural volunteers? Can one see the little political problem here? Victorian Premier Daniel Andrews was originally against the UFU when it came to the deal’s veto proposal, but he changed his mind after a meeting with UFU boss Peter Marshall without Emergency Services Minister Jane Garrett. So, a union uses its inside track access to get political support against a volunteer based organisation. The politics of who's in and who's not. One of the tricks of being a successful Labor Premier is when to say "no" to a union. Including paying attention to the optics, to how things look. Everyone knows that the Australian Labor Party is deeply connected to the union movement, which actually makes the optics more important. Particularly as said Minister has, indeed, since resigned. This goes with the Government's sacking of the CFA Board and the resignation of its chief officer. This looks a lot like yet again inside-the-bubble-connected urbanites not getting how important status, authority and control are to folk who live mostly outside looking in. In a sense, it doesn't matter who is "right" (since that depends a lot on your perspective), it is that politics is about managing disputes. If you lose a Minister, sack a board and then have the chief officer resigned, this is not a well-managed dispute. If you get lots of angry volunteers from an iconic organisation agitating against your Party in a federal election, it is bad politics, no matter how you look at it. NSW: ALP gains 4 seat. Queensland: ALP gains 1 seat. WA: ALP gains 2 seats. SA: ALP gain 1 seats. NT: ALP gains 1 seat. Victoria: Coalition gains 1 seat. Pick the odd State/Territory out. If Victoria had performed as well as other States for the ALP in the recent Australian federal election, the Coalition would not have have achieved a Parliamentary majority: something that folk within the ALP have noticed. It has been all over the front pages of the Herald Sun, with CFA volunteers and residents affected by Black Saturday quoted in an attempt to attack Andrews. Do people really understand the intricacies of the deal? 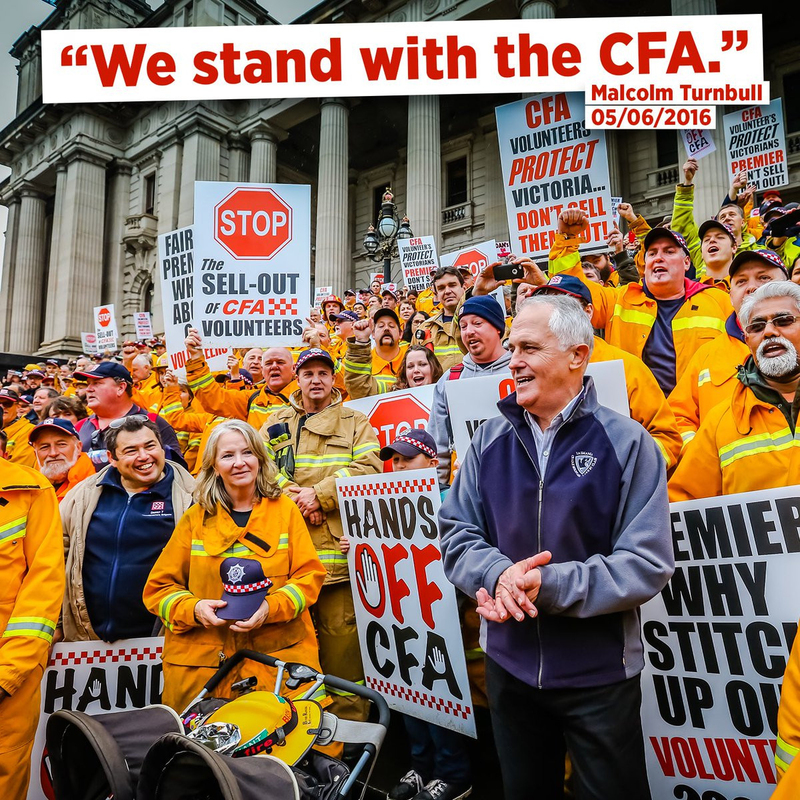 Probably not — but when Victorians consider who they trust more, the heroic CFA or a politician, the Premier is not going to come out of this battle unscathed. Why was this a dispute even worth having? What gain in public policy was worth this political pain? And if was a genuine gain in public policy, why couldn't one convince volunteers who give up their time and put themselves at risk to save property and lives? But that would take treating people outside the connected-circle seriously: something Premier Andrews has apparently, and conspicuously, failed to do. Given he was educated in Wangaratta and raised on a cattle farm, one would think he would have a bit more of a nuanced political sense on the matter. But apparently an adulthood spent entirely immersed in urban Labor politics has trumped that. Or the union was very persuasive. When folk complain of crony capitalism (which the Economist magazine has constructed an index of), they mean two (related) things: people commercially advantaged by their connections to power-holders and good public policy being sacrificed to those connections. Prominent academic and Governor of the Reserve Bank of India Raghuram Rajan pithily and perceptively outlined the appeal and problems of crony capitalism and corruption in a 2014 speech. But one can also have crony unionism: union leaders gaining advantages for them and their members from their connections to power-holders and good public policy being sacrificed to those connections. Ironically, the Western country which likely suffers most from crony unionism is the United States. The effect is concentrated in particular cities and states--dominated by the Democrats as functionally one-Party jurisdictions--where the effect of crony unionism on the cost, efficiency and effectiveness of government services has ranged from the unfortunate to the disastrous. Crony unionism was a major factor in the bankruptcy of Detroit, and its decades-long decline as a city, as it also is in the fiscal problems of California and other States. When the Deakinite Settlement dominated Australian public policy, the arbitration system in a sense regularised crony unionism. The regularisation had the advantage of minimising corruption risks, but it still advantaged the politically-connected and imposed major distortions on (pdf) public policy and costs on the wider community. While the Deakinite Settlement has been significantly dismantled, the arbitration system lives on, if in somewhat attenuated form, notably via the Fair Work Commission. (Pausing here: imagine how a "Fair Sell" Commission would operate--or, rather, let's not.) Consider crony capitalism or crony unionism from the other perspective: the cronies see the aim as having the state apparatus serve their specific interests. The Labor Party was originally created to be political face of the union movement. It has had considerable political success, though its tendency to split was a problem for decades. Up until 1972, ex-Labor politicians (Cook, Hughes, Lyons) had been in office as non-Labor PMs approaching the length of time as there had actual Labor Federal Governments (Watson, Fisher, Hughes, Scullin, Curtin, Chifley). * Since 1972, however, Labor has been in office federally about the same time as the Coalition. The combination of a labour movement having an explicit political wing and the arbitration system in various incarnations has led to an Australian union movement that very much sees state power as a tool of protection and expansion. Which is precisely what the CFA dispute looks like. Allegedly, there is a major public policy gain to be had. (One notices the former Minister did not agree.) But, even if there is, why not find another way to go about it? Either because your understanding of politics and management is so impoverished that does not occur to you, or because what is generating such objections is precisely what one is trying to do. One of the issues for Western societies is expanding states undermining civil society through replacing non-state efforts and institutions. Given the long-term problems of rural towns, undermining a particularly effective form of social capital is not good for rural Victoria. Modern progressivism has generated a plethora of techniques for discounting others, for self-congratulating blinding. Likely this is also operating here, in a rather toxic combination with crony unionism. * Labor PM's Watson, Fisher, Scullin, Curtin, Chifley and Hughes totalled 6,055 days as PM. Cook, Hughes and Lyons totalled 5,376 days as non-Labor PMs, or 89% of the time of actual Labor Federal Governments. Since the 1955 DLP split had a great deal to do with the longevity of Coalition government from 1949-1972, the ALP's habit of splitting was a major political liability. Is public policy a discovery process which takes into consideration the diverse interests, experiences and perspectives of the political nation (however defined--in a democracy, that is supposed to be the entire citizenry) or is it an engineering problem, an application of applied knowing? There is, of course, a lot of engineering at the implementation level of public policy. To take some obvious examples, such things as roads, bridges, dams, etc are engineering problems in their construction. But policy in general is full of aspects where technical knowledge is important. Which can easily encourage the belief that policy problems are engineering problems all the way up. But the further up the policy process such a claim is made, then the greater the claims of knowledge, understanding and normative authority one is making for the policy makers. Conversely, the more sceptical one is about such claims, then the more comfortable one is with the notion that public policy is embedded--and rightfully embedded--in discovery and bargaining processes. Which encourages confidence in multiple levels of government, so that such discovery and bargaining processes can take place in varying jurisdictions among varying players. The irony of opposition to federalism is that by implying one or more levels of government are redundant, one is making strong claims about the knowledge, understanding and normative authority of the remaining level(s) of government. The implicit notion is that there is a correct policy, which is easily discovered and reliably implemented. The more confidence one has in people in general, the more one is likely to endorse broad consent and bargaining mechanisms. The more confidence one has in a specific group of people relative to the wider population, the less so. The more belief on has in knowledge being dispersed, the stronger sense one is likely to have that policy has to be understood as a discovery process--remembering that social bargaining is itself a discovery process. 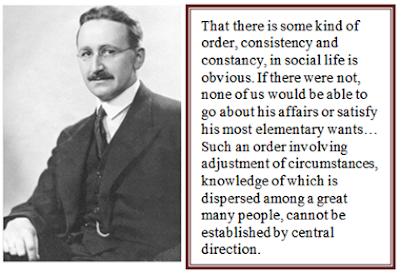 Noting also that politics is not the only discovery process, nor the only general process for achieving social ends. The more belief one has in the level of understanding of a specific group or a specific framework of ideas, the more belief one is likely to have that policy is a process of applied knowing which bargaining gets in the way of. In this conception, diversity of policy is simply multiplying error. It is hardly surprising that intellectuals in general have a tendency to see policy as applied knowing and be impatient with social bargaining and policy diversity. Their life and identity is bound up in their sense of being the people who know more than others, with a strong tendency to also flatter themselves as folk of superior virtue--including the notion that it is their greater knowledge which leads to their superior virtue. The long arc of history is not flattering to such pretensions, but they are so natural to the work of intellectuals, and so inherently self-flattering, that they retain a perennial appeal. Flowing from these tendencies is their recurring tendency to sneer at the profit-seeking of commerce, so lacking in grand pretensions to virtue and with its lively ordinariness so failing to apply to whatever grand moral schema intellectuals dream up. The claimed grounds and content of virtue have varied enormously, as have the grand moral schemas; but the disparaging contempt for commerce is a hardy perennial across time and space. The (very) long arc of history has tended to favour policy as discovery-and-bargaining processes, but the temptation to retreat into "but this time we just know!" is also a hardy perennial. The development of economics has tended to point in both directions at once. Mainstream economics tends to be favourable to markets, including markets as discovery processes. But the sense of understanding how things work can lead to deprecating political bargaining as something that gets in the way of good (i.e. economically informed) policy. An amazing amount of nonsense has been written by academics about "neoliberalism", typically because they never seriously interact with folk who might be in any way sympathetic to "neoliberalism". Neoliberalism has come to mean not much more than "anything vaguely market connected that has been bad since 1980". If we define neoliberalism as (in the Western context) the application of mainstream economic policy so as to create a sustainable welfare state, then the neoliberal policy surge has, at times, been guilty of seeing political bargaining as "getting in the way". Of it providing an unhelpful obstruction to policy being just applied knowing. Not always--the Hawke Government, in particular, provided an excellent example of accepting that political bargaining was a necessary part of the process. Nevertheless, impatience with political bargaining has been something of a failing of the neoliberal push in policy. The polity which has done the most to give neoliberalism a bad name is the EU (European Union). Ironic, in a way, as its bureaucratic aggrandising is not what neoliberalism is supposed to be about. Still, creating a common market for the free flow of goods, services and people looks like a very neoliberal project. As does creating a common currency with a strongly anti-inflation central bank. But looked at through the prism of political bargaining and policy as discovery process, and the European Union looks a lot less impressive--particularly compared to the European Economic Community (EEC) that proceeded it. The EEC was a neoliberal project, and a very successful one. A particular virtue being the insistence that only democracies could join. The Common Agricultural Policy was regrettable: a form of political bargaining in a way, but one which seemed an iconic example of narrow, organised special interests triumphing over general interests. Nevertheless, the EEC had a deserved association with prosperity and international cooperation. The EU, not so much. The EU has become a case study in policy over-reaching. Harmonising regulation has been an example of suppressing policy-as-discovery process and, at best, very narrow social bargaining. Worse, as the reach of the European Project has grown, it has had an increasingly invidious effect on policy making within the member states by becoming a means to avoid accountability for policy actions and consequences by muddying who is responsible for what and providing blaming cover for actions. 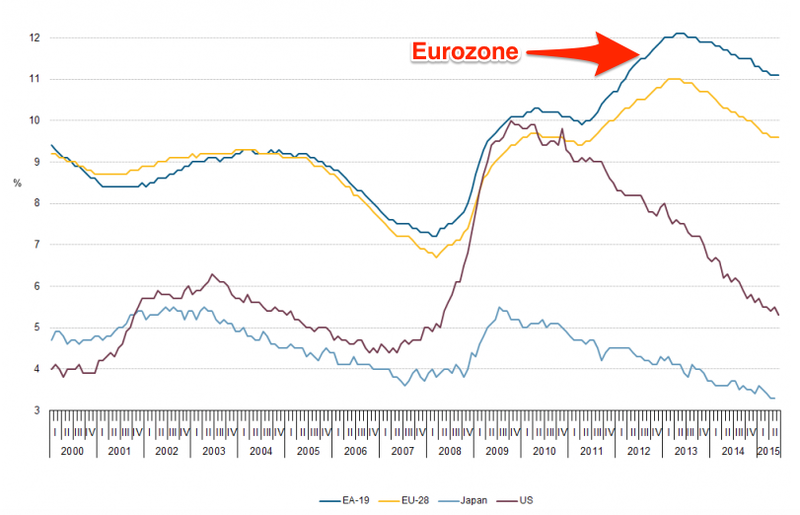 But the worst over-reaching has been in the Euro and the ECB (European Central Bank). The idea of the Euro was straightforward--a Deutsche Mark for everyone. Something with very strong appeal, particularly for those used to high inflation "soft" currencies. 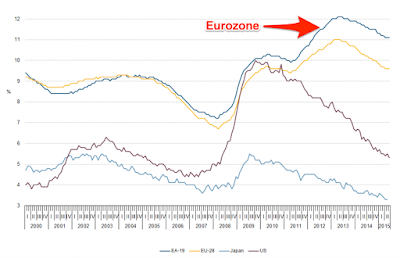 The problem with the Euro is that it became a Deutsche Mark for everyone; the entire Eurozone had a monetary policy imposed on it that suited Germany first and others much less, with the greater the differences between a particular economy and the German one, the worst the consequences. The human costs of the Euro alone has made the EU a morally very dubious construction. Between the costs of the Euro (including fiscal austerity, with the underlying problem being monetary austerity), the deep muddying of policy accountability, and the resulting adverse effects on the quality of policy and sense of popular control, the EU has managed to generate increasing levels of "angry votes", including increasingly nationalistic political movements. How much in any particular country is still mediated by local political circumstances and levels of economic stress, but the wider pattern is clear enough. Which comes back to the original sin of the EU--the original misdiagnosing of the problem of European history. The origins of the EU were based on the premise that the deep problem of European history was nationalism. This is false: Europeans have never lacked reasons to kill each other. The deep problem of European history has been unaccountable power. Whether it was dynastically-grounded regimes using the weapon of nationalism to fight off the spectre of democracy (and then being consumed by the total war they could then not stop and failed to survive) or dictators wielding totalitarian power in megacidal projects, nationalism was a tool, not a cause. But to make nationalism the great problem of European history is also to make the people of Europe the problem of European history, not inadequately accountable elites, given that nationalism is a sentiment among people. And if popular sentiments are the key problem, they cannot be allowed to be let loose. Hence the elite-dominated European project conceived as a restraint on the deemed problematic peoples. Well, how has that worked out for them? The notion of the EEC--to entangle the people of Europe so deeply with each other, and anchored in a common prosperity, that war became inconceivable--was a noble one. The notion of the EU--to use ever-greater-union as ever-more-constraint-on-local-democracy--was not. It became a project of policy as applied knowing and (at best) very narrow bargaining. Not a project of policy-as-discovery process and broad social bargaining. Clearly, more and more people have felt left out, ignored or worse. Moreover, as the policy reach of the EU has exceeded its actual knowledge and effectiveness, while having an invidious effect on policy accountability, it has become a mechanism for making policy worse, not better. Moreover, seeing the peoples of Europe as the problem has blocked learning anything from the resulting angry votes: treating voting patterns not as discovery process, but as confirmation of deeply problematic (indeed, profoundly counter-productive) assumptions built into the European project and oh-so-flattering to European elites. The lack of a European demos is, of course, an advantage to evading accountability. But the consequence of that is poorer policy and more political alienation. Entangling the people of Europe with each other should have been seen as a way of making certain sorts of politics less appealing, as a constraint on power holders, and those aspiring to the same. Not as a way to "manage" identities. The original underlying structure of the EEC was a fine idea. The EU built on top of it, not so much. If one sees only the first while refusing to confront the second, one is going to continue to misdiagnose what is going on. No, the peoples of Europe are not the problem. They never have been. Those who have seen them as the problem, they are the problem. What they thought they knew, they so didn't. They urgently need to rediscover a sense of policy-as-discovery-process, one properly based in broad social bargaining, not in demonstrably overblown notions of applied knowing.